On the Philippine side, navy spokesman Colonel Edgard Arevalo confirmed Tuesday that the exercise is part of a series of activities lined up for a country visit by the JMSDF from June 22 to June 26. While he did not say where the new exercises would be held or which ships will take part, he did reveal that the joint training will include humanitarian assistance and disaster response, maritime search and rescue, and maritime situational awareness training and cooperation. Arevalo also said that the engagement will help share new tactics, techniques, and procedures as well as best practices to further maritime operations. Staff-to-staff talks will also be conducted during the visit to strengthen information-sharing and step up maritime situational awareness. The exercise will be the second between the Japanese and Philippine navies, since the two countries did carry out a drill last month as The Diplomat reported. But some reports have chosen to call the upcoming exercise the “first formal, full-fledged” exercise between the two countries, since the last drill was billed a ‘passing exercise’ to test the Code for Unplanned Encounters at Sea (CUES) while two Japanese destroyers were on their way back to Japan following a four-day visit (See: “Japan, Philippines Hold First South China Sea Naval Exercises”). The new drill to be held later this month comes shortly after Philippine President Benigno Aquino III’s visit to Japan in the first week of June. 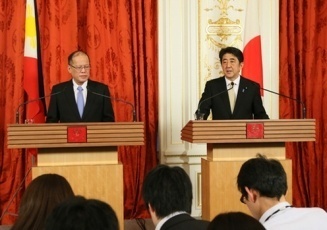 During that visit, Aquino and Japanese Prime Minister Shinzo Abe both pledged to strengthen the security side of their strategic partnership through a range of measures including concluding an agreement on the transfer of defense equipment and technology and expanding bilateral and multilateral trainings and exercises (See: “Japan, Philippines Declare Strengthened Strategic Partnership”). The two countries have also agreed to open discussions on a visiting forces agreement that would allow Tokyo access to Philippine military bases (See: “Japan, Philippines Seeking New Pact on Military Bases”). What’s Next for Japan-Philippines Defense Ties? A brief look at what’s next for the burgeoning strategic partnership.